Well, that explains a lot of our complaints from last page. Tyler didn’t want this stuff. Also, maybe Sarah is mistaking Tyler for Toby, who has been visiting P&G to get his brother some powers. Okay that does explain a lot, and make me not dislike Toby anymore. Could also explain what he’s done to control his powers. Toby you can’t fix your family, not without outright brainwashing. Even if you can give your brother powers without any side effects that won’t fix your family. Even if your “parents” accept Tyler that way that won’t fix your family. Until your parents decide on their own to change and apologize to Tyler, you can only make the brokenness less obvious. I don’t think Toby understands how imperfect a copy he is, and how much Tyler has grown apart from him since then. Tyler did want to please his parents there is still part of him that does but from what I have seen its rare that he put some impossible desire to please them ahead of living. Maybe Toby just means that he’s going to fix the raffle to give Tyler some item that WASN’T one he’d tried before and that Toby thinks SHOULD work? Brainwashing IS an option. And with balance being required you move some love from Toby to Tyler, and then something of equal value from Tyler to Toby. Now, if I remember my Emotional Alchemy 203 class correctly Love is a Willingness to Sacrifice for The Benefit of Others and its opposite is Hate: The Willingness to Sacrifice to Harm Others. SO you just take Love that would be directed at Toby and move it to Tyler, and then move some of the hate they have fro Tyler as a reminder of their failings and move it to Toby. In order to “earn” that hate Toby will probably have to embarrass them in some way but that is a small price to pay to make sure your brother gets the parental love he needs, and isn’t that how siblings are supposed to work? Now how to get Tyler to accept his brainwashed “parents” “love”. I mean brainwashing obviously but what is do we need to do to pull that one off. Ah, not quite. Hate is the *inverse* of Love, not its opposite. The opposite of both Hate and Love is indifference — which is why so many people reading this comic despise Tyler’s parents. He’s going to give his parents a slideshow of successful and happy non-powered people who can serve as proof that Tyler can live a fulfilling life. Like that President Cranston guy. He did pretty well for himself. Can’t help but hear Toby say “This time will be different!” in the voice of Dr Weird from Aqua Teen Hunger Force. HALPING! Poor Toby… I mean, he is Tyler, one who’s been given everything he ever wanted, except for the love and acceptance of his twin brother. Possibly even HELPING, although I can appreciate the call back to the Septos arc. And which he may not ever have. Toby didn’t say he was planning to give Tyler powers, that’s just what Tyler is assuming. Possibly Toby has some other plan in mind, one that does not involve powers, or involves not having powers. Nothing can possibly go wrong with whatever Toby is planning. Indeed this can only end well. Indeed, giving someone powers for which they didn’t ask is always a most excellent idea. Especially when they are recovering from a phobia of basically anything that may give them super powers. That is not a phobia, that is common sense. Especially since most of those can and will kill you. Ohhhh crap, that makes SO much sense. Oops, that was meant to be @MatthewTheLucky. This will end in pain. My Pizza’s getting cold..And The Forecast Calls For PAIN! Do you think if Tyler starts running now, he can escape the blast radius? Tyler has picked up the heroic tendency to run towards explosions, so he perhaps could, but won’t. It is interesting how Tyler without the Revenant’s training and with sudden love and approval of his parents becomes more reckless. Probably affects things that he’s entirely aware of just how conditional the “love and approval” is. And powers that make him fundamentally less “squishy”, don’t forget that! Imagine what a happy child he might have been without all the trauma…. There was a Twilight Zone episode about that. Everyone was afraid to try to give him direction, because his temper tantrums could kill, so everything he did was good. He would do typical creepy child things cause he was a kid. And he did actually try to make things better for people but being a kid who didn’t fully grasp the consequences of his actions usually made things worse. By the way, the page for October 7 isn’t shown in the Archive for this “issue”. You can get there by going to the pages around it and navigating from there, but not directly from the Archive menu. Oh Man! I Get The Feeling That Toby Is Going A little Bit Power Mad. I believe we now know who the other Customer was at Power and Glory. Oh. o_o That…. had not yet occurred to me. Interesting idea. Oh… That’s clever! I hadn’t thought of it like that… Explains why she thought it was Tyler too. Nice pickup. Toby was there for Tyler, Sara saw him, and that’s why she keeps accusing him of trying to get powers from them also. As said before, Toby is lonely and hopes Tyler with powers and he can have each other. He’s on the same arc that Tyler finished, realizing the conditional love isn’t real. But it’s coming at both a younger and older age. I do not think he’s broken, he’s just reacting like a 3 yr old in some ways, despite his appearance. He’s had to grow up even faster than Tyler. I think it’s time for Toby to meet Moon Shadow, they need to bond as Mom and Dad are useless. … and after all we all know that this will not be just a party. They would actually make a rather good “World’s Finest” team, wouldn’t they? See, I always thought the “World’s Finest” team would be Moon Shadow with Captain Clarinet, but that didn’t work out. Moon Shadow and Junior Powers, that sounds like something that’ll be interesting. I had hoped for Captain Clarinet too, but as he not only dislikes, but just about outright hates Mooshadow, It just cannot happen until he realizes that he’s been deluding himself. It will take a while for him to accept that and forgive Moonshadow. I just want to see Toby’s reaction. Revenant alarms supers and a measure of comtempt, which is bizarre when they’re also a little afraid. Fear the Bat… er ghost. I love a good buddy series where one is savvy normal and other powered: Bats/Super, Arrow/GL or Flash. That humanizes and keeps the powered one from getting too cocky. I think Ron doesn’t hate Moonshadow as much as he used to. This is a double kick in the feels – one past and one future. The past one is the fact that the Powers are giving away Tyler’s old stuff, which once again brings up all of the misparenting and related problems. The future one is the dread of knowing that Toby’s efforts will go spectacularly wrong for several reasons. For one, every time Toby uses his greater power there is backlash in an unexpected direction. Add to that the fact that he is trying to do a quick fix for something that is caused by major underlying problems that cannot be fixed easily. And on top of that, Toby is trying something well outside his known competence. Cue the popcorn, the readers who like drama are likely to be entertained at least. To be fair, if he doesn’t WANT the old stuff, I doubt he’s going to be that emotionally hurt by them giving it all away. Yeah, this is basically cleaning out the old toy chest, which is a bit of a necessity after a while. You do have to make room for the new stuff (in this case, Toby’s eventual wall of trophies from bad guys defeated). Everyone and every situation is different but often times getting permission first can be the difference from something being emotionally scarring and being a favor. Even with little things that can be the case. I think after all the other junk his “parents” did to him that giving away things he never really wanted barely registers but still jerk move. Its also a reminder that likely the only “presents” Tyler got from his “parents” were attempts to fix him. I’m hoping that Tyler packed anything he had an emotional attachment to for the dorms, so that stuff would be safe. Calling it now: The Reverent will have save Tyler from whatever nonsense Toby has planned. And this will only deepen the divide between Tyler and his Parents. Also, I think we (or even our Author) is ignoring something: Toby is a reality warper, He could just give Tyler powers. And give Ron his powers back. Of course there is no way that could go right, but Toby has that ability. Our wonderful and illistorious author has not forgotten these things. In fact Toby gave Tyler powers once before, except the “balance” from doing that act made it so that everyone on the planet who didn’t have powers got them, and everyone who had them lost them. As you can imagine, this didn’t go well, and almost lead to the destruction of the planet. In the end the only was that Toby could fix the situation was to put everyone, including Tyler, back to normal and erase their memories. This story was illuded to in volume 7 issue 37, Destructive Writing. ? Yup. And no Toby has gained a new level of control over his powers. “control over powers” =/= “being able to do away with the cost using said power entails”. I have to pay, say, $20K for a new car. I don’t have that much currently and/or paying that amount in full will leave me broke. Instead, I can pay by installment or I can take a loan. In the end, however, it doesn’t change the fact that I had to pay $20K. Finer control probably only means he can predict and modify the balance demanded by his powers. But the sum of said balance, however carefully chosen and spread out, remains unchanged. But the balance can never be less. Uh oh… apparently Toby can do minor things without the universe getting upset, but I suspect this is not one of those things. Dang, I’ve been waiting for this for a long time. I know something will go wrong, but if Tyler walks away with superpowers, I will cry tears of joy. Tyler -has- powers; he’s Batman. (well, Moon Shadow). 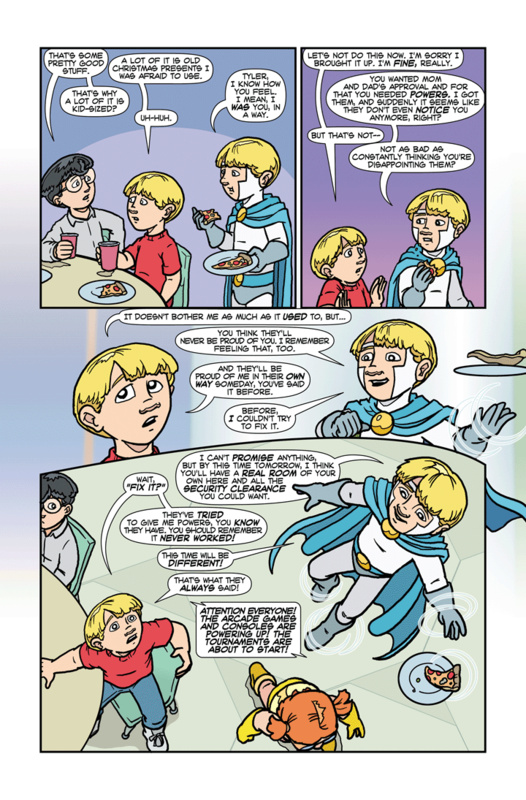 To a large degree, his ability to resist getting more active powers than karmic importance is also a rather important power; I suspect most people could be granted superpowers without the kind of backlash that’s happened the last few times it was tried (ie, Toby’s origin, Toby switching around everyone who had and didn’t have powers). I know that this is destructive to all of the people who have dedicated whole pages to the reasons of why people don’t need powers, and topics of a similar nature, but you need to remember two things. Having a different persona is nowhere near powers, and I am a traditionalist in the sense where I consider someone with powers to have abilities far beyond the scope of the farthest reaches of what a human can do. Speaking as a person with superpowers myself, I have distinctions that other people may not agree with. I have suspected something of the sort–that something so major hinges on Tyler not having powers (or rather, being the person shaped by not having powers) that attempting to give him powers is like trying to shift the foundations of the Earth. It’s fighting Fate head-on. We may already have seen a hint of this, with adult Moon Shadow choosing not to intervene in Tyler’s past when they spoke on the phone. Fun bit from an outside source: In the PS238 RPG book, Tyler’s state was modeled by actually giving him a power, “Lucky Boy”. The player can’t activate a Luck power; the GM decides when to have them make a Luck roll. Each 6 on a d6 in the roll gives a “luck point”, representing events somehow breaking in the character’s favor. Tyler gets 3d6, which means he’s got a 50% chance of catching a lucky break in any crisis, and about a 0.5% chance of getting miraculously lucky. Oh dear. What if Power & Glory are the result of Toby’s cosmic powers, and not merely a tool he’s hoping to employ to give Tyler powers? How would Toby learn about Power and Glory in the fist place, apart from his ability to detect “storylines”? He already has powers, and they probably wouldn’t want to make themselves known to the powers in the first place. No, no, I mean something a bit more worrisome: What if Toby’s powers brought P&G into existence because he wants Tyler to get powers in a way that doesn’t break the universe? Ooh, good thinking. I don’t think that this is the case, though, because of how P&G were talking about prior shops. There is a possibility that Toby could create them in the past. This is possible, maybe even likely, because of the extent of Toby’s powers. However, there would also be the matter of finding something that “fits” Tyler. (PS238 2016-06-01) Given the extent of their collection, I doubt this. Given the unpredictable manner of Toby’s powers, his actions in the future could affect the past, therefore creating P&G. Well, we know that his powers create a “balance” effect that makes as much Order to counter any Chaos he creates, and vice-versa. If he deliberately chooses a means of achieving his end which will have its own “balanced” repercussions overall, he can at least control the shape of the whole thing. I’ve posited before that the way to learn to control his powers would be to figure out ways to do two things he WANTS to do at once, where one thing results in order and the other in chaos. In this case, however, retro-actively creating a power-granting agency would foment its own chaos to counter the ordered power set it will give Tyler. No, I am not hanging my hat on this one. It’s just one of my WMGs. I suppose finer control allowing Toby to help Tyler get powers could amount to Toby using his powers to finding and acquiring an appropriate artifact or gadget that could do such a thing, adding it to the available items to be raffled off, and then cause Tyler to win said such item. I don’t see that as being problematic for Toby’s powers if he really has gained finer control. However, the interaction of such an item that is untested and unknown with a resistant to gaining powers Tyler, THAT might be a problem.